My summer had ‘officially ended’ with a sweet and relaxing weekend being a tourist in my own city of Washington, DC. On the agenda was a quick trip to nearby Thurmont, MD. Where you ask? I too was unfamiliar with Thurmont until recently. In an effort to quell my insatiable wanderlust, I’m making a concerted effort to seek out gems in my city and surrounding areas. Being a tourist in my own town if you will. With that in mind, I searched for an interesting outing a short driving distance from Washington, DC. There she was…Thurmont, MD. It was close, quaint and the local winery was hosting a pig roast. Cool! We packed the little blue jeep with blankets and picnic gear before heading out for a scenic drive to historic Frederick County, Maryland. 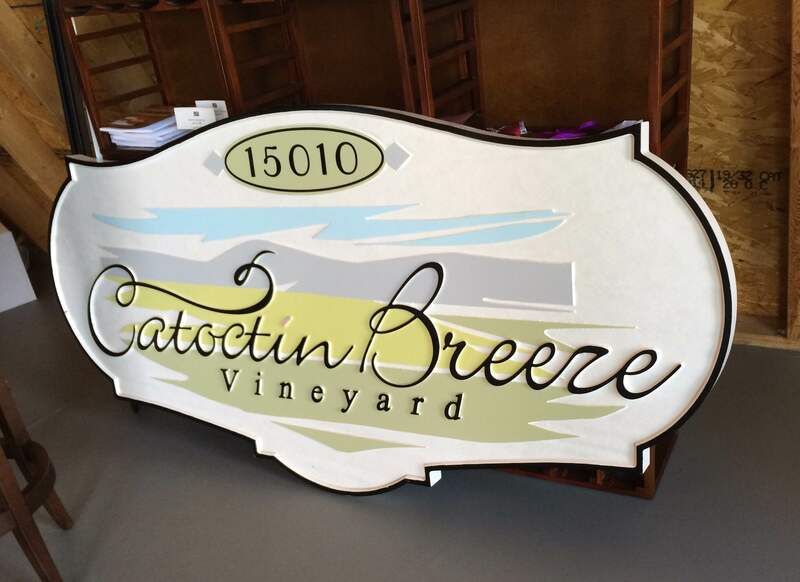 Just under one hour and thirty minuets later we arrived at Catoctin Breeze Vineyard. It was exactly what we needed – laid back vibe and small community charm. The local high school was having a fundraiser for their drama club by hosting a pig roast. Present were locals, friends and family of the students. Well, OK, I was really there for the wine but what a great way to donate to the cause. And by donate I mean purchasing and sipping dry whites (part of the sales went to the fundraiser). A beautiful fall day in Thurmont. Perfect setting for a picnic. After enjoying our picnic and lovely wines at the vineyard, we were off to hunt for the three historic covered bridges nearby. 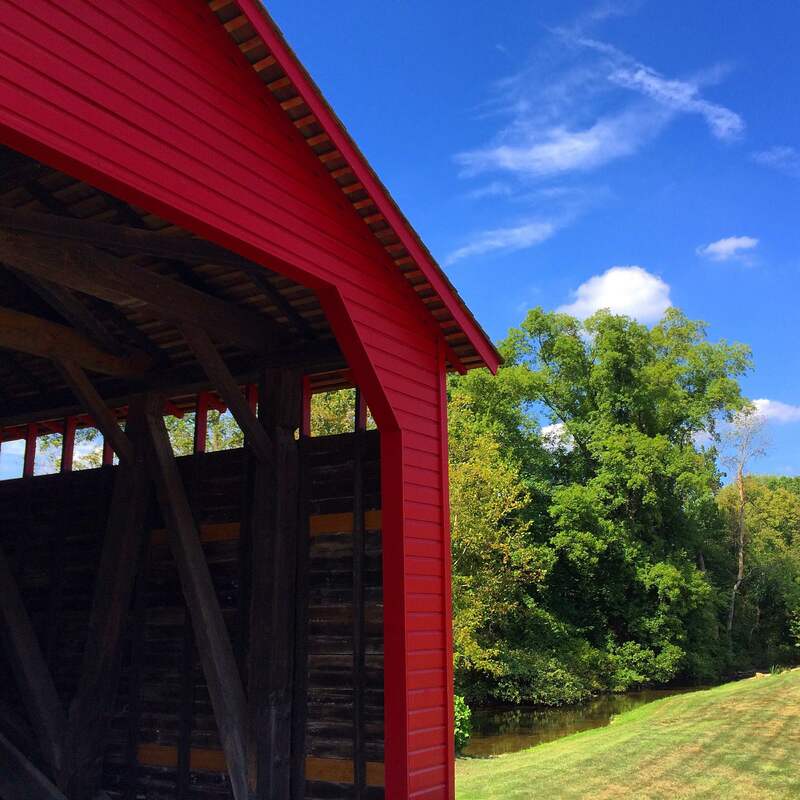 Once there were a total of 52 covered bridges in the state of Maryland. Overtime, the structures were destroyed by either weather, fire or simple neglect. 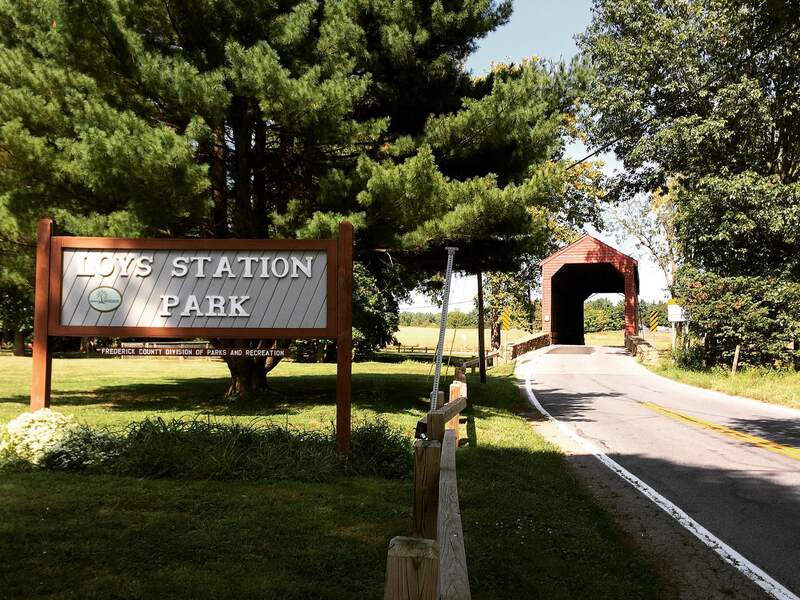 The Roddy Road, Loy’s Station, and Utica Mills bridges are three of the only eight remaining covered bridges in the entire state. They are all listed in the National Registration of Historic Places. I found them to be lovely and their history quite charming. 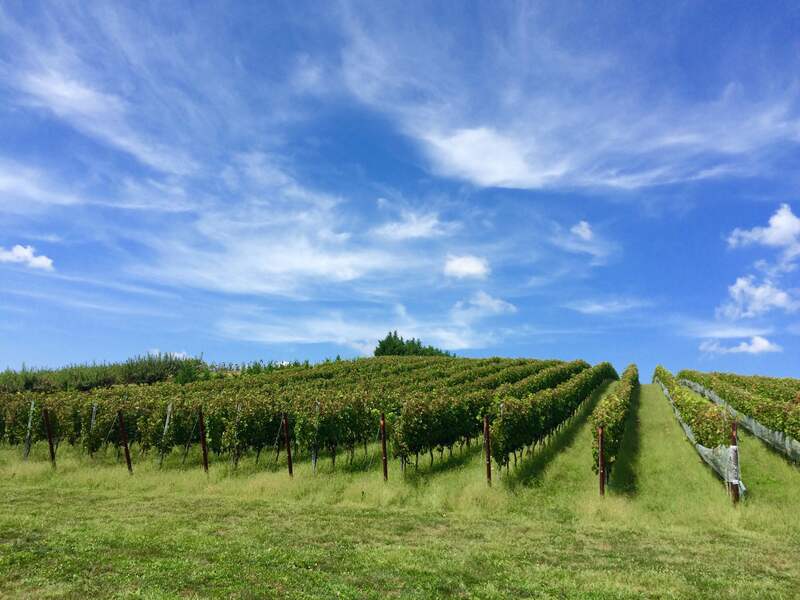 Frederick County, Maryland is a quick drive from Washington, DC or Baltimore, MD and offers interesting activities for everyone. 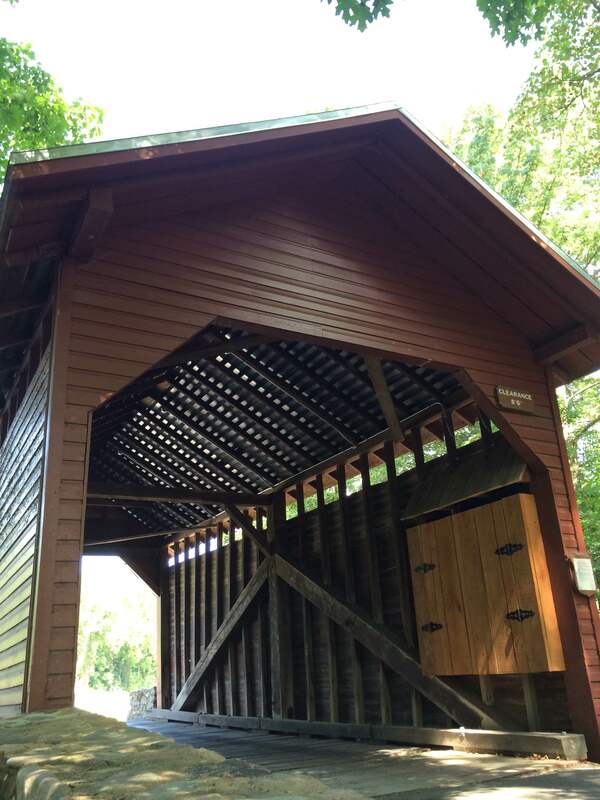 There is hiking, biking and of course, covered bridge hunting. For you history buffs, this area of Maryland is a hotbed of historic sites and great of self-guided or organized walking tours. Interested in planning a trip to Thurmont or another Frederick County stop? Find more information here.